How well does SharePoint work with Chrome? Well, Google has launched the next broadside in the battle between Redmond and the Googleplex – their own ‘Chrome‘ Browser. Creating a browser makes a lot of sense for Google, really – IE7 had ‘Windows Live’ as the default search provider for the Search box, so Microsoft were clearly starting to try and leverage their ownership of the desktop, and the browser on it (which, of course, is leveraging their ownership of the operating system – though having a web browser integral to the OS seems bloody stupid to me!) And yes, you can add Google as a provider, and set it as the default (I always do) – but it’s effort, and a bit scary for my granny, you know? Hmm. One of our salesmen called up today with an interesting problem. We’d published some PowerPoint presentations as slide shows (.pps files). If you open one of these, it should just launch PowerPoint into the presentation. However, he was opening them from our website and they were opening as a normal PowerPoint (.ppt) file. That is they were opening ready for editing, not in presentation mode. Weird. First off I noticed that the file extension was .pps – good. I tried opening the file – and it opened it as if it were a .ppt file. Weird. So then I tried the other option – I saved it to my local machine and opened it locally. This time it opened correctly – it opened as a slideshow. Hmm. So, they’re the same file, but something different is happening when they open. I wondered if it was to do with the HTTP headers, but the same difference occurs when the file is being served with the application/vnd.ms-pps or just text/html (we run MCMS 2002 on a IIS webserver but publish as static content to an Apache server. 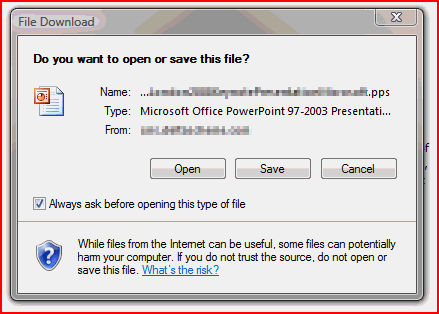 They serve the file as different mime types, but have the same result – Open opens the file for editing and Save and open shows the slideshow). Next up, I tried the same experiment using Firefox. If you choose to Open the file rather than save it, it opens the slideshow – correctly! And if you save it, well, it saves the .pps file which, again, opens correctly. So it looks like Internet Explorer will not open a .pps file as a slideshow irrespective of the mime type sent by the server and the .pps extension (and it’s file association in windows). However, if you save the file locally, it will. Weird. The only thing that I can think is that this is some sort of security feature, but it’s a bit odd – after all, shouldn’t Firefox do this then?